Many of my contemporaries must have seen the famous classic Hollywood Film called Ben-Hur. That is one film which I cannot forget in my lifetime. Whether it is the awesomeness of the scenes or the performances by the greats like Charlton Heston or even the practical visual effects they have used in the film and throwing a challenge to the world asking to find one error in the film! Remember, those days, you don’t get to see the film frame by frame and look for errors. Of course, lately so many people have found some errors like a watch worn by one of the characters, etc. But what I am going to talk about here is a very different matter. It is about a particular sequence in the film. And that is the sequence of the War-boat interior the slaves row the massive boat. Each of the massive oars is handled by three hefty musclemen. Like that there are 3 men on either side of the hull interior where no light can enter from outside. All of them are chained to the floor on their ankles. Now here is the point. These are the slaves chosen based on their strength. And these boats are the War-boats which are taken for battles in high seas. Under the level of the rowing section, in the lower hull, more slaves are kept to replace the displaced slaves. All are chained and kept. The whole atmosphere of the place is dark and grim. There is a platform in the front of the row chamber on which there is a huge drum behind which a huge drummer sits with huge drumsticks. He beats he drum based on the command given by the commander who stands beside him. There are two soldiers who walk up and down the aisle monitoring the slaves who are rowing the boat. They carry a massive whip to make sure that none of the slaves slow down or go off-beat to the rhythm that is played by the drummer. None of the slaves can look outside they have no idea which direction they are rowing and what is there in store for them. They are just forced to do what they are supposed to do without a break till they are thrown out of the ship or till the war ends. Now let us discuss a completely different scenario. The boat has a very unique design. It is very long and accommodates more than 100 oarsmen. Hind part stands very tall from the water level. And the bow is almost about 2-3 feet above the water level. Sides of the boat, when all people are seated, the edge of the boat is hardly 6 inches above the water level. There is one rower sitting on the bow of the boat who controls the direction of the boat. He is the one who gets hit first which means he protects rest of the people from any head on collision. Behind him sit oarsmen on either side of the boat with short oars. Towards the middle of the long boat, there is a wooden platform on which there will be 3-4 people standing who sing a high energy song with great rhythm. One or two of them holds a wooden staff vertically with a thick wooden piece fixed at the bottom. They beat the stick on the wooden platform like a drum to give a rhythm to the oarsmen and the singers. 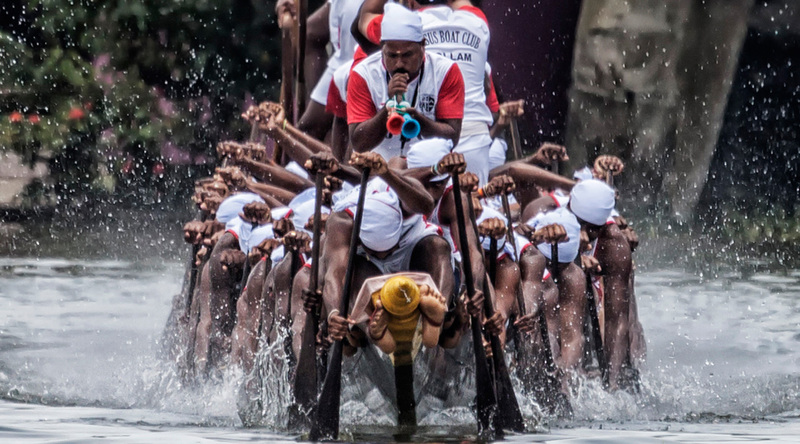 Behind the 100 plus oarsmen, there are three people standing with very long oars. They stand at different levels depending on the upward curve of the boat. These are the people who hold the boat from falling to any one side. They do that with that large oar dipped into the water. These three people can see the entire ship and the people in it from a height. They also can see far ahead of the ship while the person sitting at the bow only focuses on the immediate front of the boat. 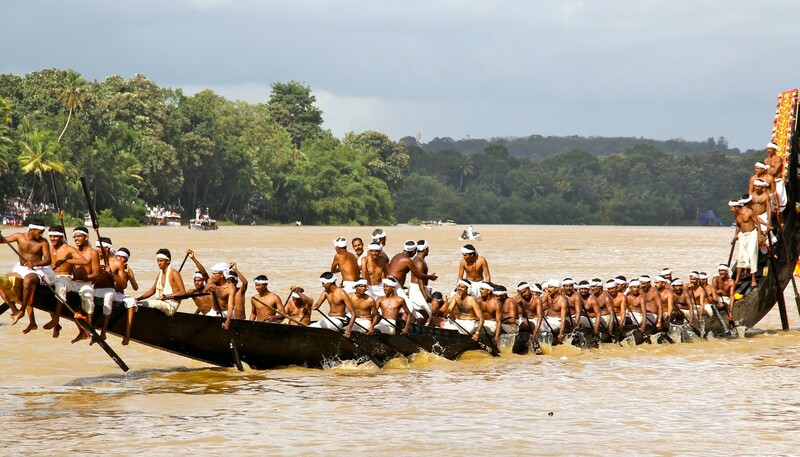 These days, the Snake boat s used as a racing sport and the race starts from a point and races for about 1.5 km. There are multiple tracks like in any athletic event. The oarsmen row with all their might on the rhythm given by the wood drummers and the inspirational singers. The oarsmen can see all around in the open landscape but they are just focused on their oar and the rhythm. Nothing distracts them. They just play with the team and enjoy the whole thing using their full might. The safety, protection, direction in which they are going and the holding the ship from sinking is taken care by the one person on the bow and the three persons on the tail. The oarsmen have full faith in the four-some with regard to their life and safety. And the foursome has full faith on the oarsmen about their commitment and their focus on the job. They are left alone. The singers and the Rhythm people make sure that they are supported and motivated to the full so that they don’t get distracted with other silly stuff. Try to compare the above scenarios with two different organizations. It is a no brainer, which kind of organization one would choose to work with. One would decide to rather die than working in a dreaded organization like the Roman Boat and one would be even ready even to die for being in an organization like the Snake Boat. Gone are the days when people could be made to work with whiplashes. Amma passed the link to us.